CLASS SUIT. 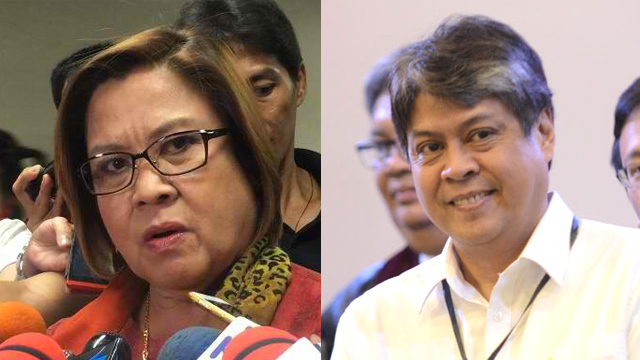 Senators Leila De Lima and Francis Pangilinan suggest the filing of a case before a court to stop the hero’s burial of former president Ferdinand Marcos at the Libingan ng mga Bayani. Senators Leila De Lima and Francis Pangilinan both cited Republic Act 10368 or the Human Rights Victims Reparation and Recognition Act of 2013, which allocates some P10 billion, sourced mainly from the Marcoses’ deposits in Swiss banks, to about 10,000 human rights victims. If the state passed such a law, then it only goes to show that the government acknowledged the atrocities of the past, said the two senators. “Baka kako puwede ‘yung injunctive class suit. 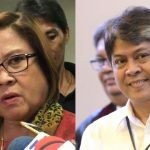 Because if they have the right to demand for monetary compensation sa mga ginawa sa kanila, then hindi ba puwede na puwede nilang pigilan ‘yung paglalapastangan ng mga nangyari sa kanila?” De Lima told reporters on Monday, August 8. Pangilinan, for his part, expressed hope that President Rodrigo Duterte would still change his mind. But if not, he said the last option would be the court as the state granted compensation to martial law victims. “I think mayroong pagkakataon na dalhin ito sa hukuman para magpasiya ang hukuman dahil mayroong batas na maliwanag po na nagsasabi na nagkaroon ng gross violation of human rights noong panahon po ni Marcos. Kaya nga po sila ay bibigyan ng compensation,” Pangilinan said. The burial – if it pushes through – might just violate the existing law, Pangilinan said. Citing RA 10368, the senator said “the state hereby acknowledges its moral and legal obligation to recognize and or provide reparation to victims and their families” who suffered under the Marcos regime. “Taliwas po ‘yung pasiya na iyan dito sa batas na ito so we can make a legal argument against the burial of the former president dito sa Libingan ng mga Bayani,” Pangilinan said. Senate President Pro-Tempore Franklin Drilon, another LP senator, also opposes Duterte’s decision. “I urge the President to reconsider his decision. At this point in the history of our country where Filipinos are starting to hope again, what our nation needs is unity in order for our country to succeed socially, economically and politically,” he said. Drilon added that the issue would only divide the nation at a time when it has only started to heal. “Hence, such a sensitive issue would not help but only divide our people and reopen the wounds of the past that up to now, were not completely healed,” he said. Even two of Duterte’s closest allies in the Senate – Senate President Aquilino “Koko” Pimentel III and Senator Alan Peter Cayetano – have strongly opposed a hero’s burial for the late strongman. While the two said they do not consider Marcos a “hero,” both said they respect the President’s decision. “If I were president, I would not allow it. I don’t consider him a hero. Ayun lang, ‘di ako president (But I am not president.) We will respect the decision of the President,” Pimentel told reporters. “Well, you know, I see the point of the President that kung (if it’s) completely legal issue, he’s entitled to it. Pero ‘yung pangalan kasi ng libingan ay Libingan ng mga Bayani (But the name of the cemetery is Heroes’ Cemetery) and we do not consider him [a hero]. He had heroic moments during his life. But we do not consider in totality heroic because of the things that happened in martial law,” Cayetano said. As early as the 2016 campaign, Duterte has said he wants to put an end to the issue. On Sunday, he reiterated that Marcos deserves to be buried at the Libingan ng mga Bayani.